Showing 1 - 15 of 99 articles tagged "Ellen"
Baldwin tells Ellen DeGeneres he and his young kids refer to Saturday Night Live as "Saturday. "Four years ago, @JussieSmollett came out on my show. Has Ellen DeGeneres become bored with her daytime talk show? 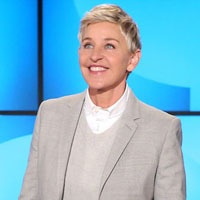 DeGeneres made headlines last month when she hinted she may exit her show when her contract ends in summer 2020. James Corden: "I still might get fired. I think that every day"
Ellen's Game of Games reveals that Ellen DeGeneres is "kinda mean"
Although Ellen is very funny, there is something about her that comes off a little mean, says Joe MacLeod.